​New York City was always this mystical giant of a place to me growing up. However, during my recent 5 year stay there I learned it can be extremely isolating despite the immense amount of everything. Crowded Isolation is a collection of Gelatin silver prints and is my attempt at depicting this extreme alienation through film photography. I use the city as a stage and my photos as actors to depict my perspective of how one of the world's biggest cities can feel like one of the loneliest places. From the occupied commuters, to the caging architecture NYC felt trapping. The day to day chaos often left me feeling drained, alone and confused. However, in these feelings of loneliness and entrapment I found a sense of community. 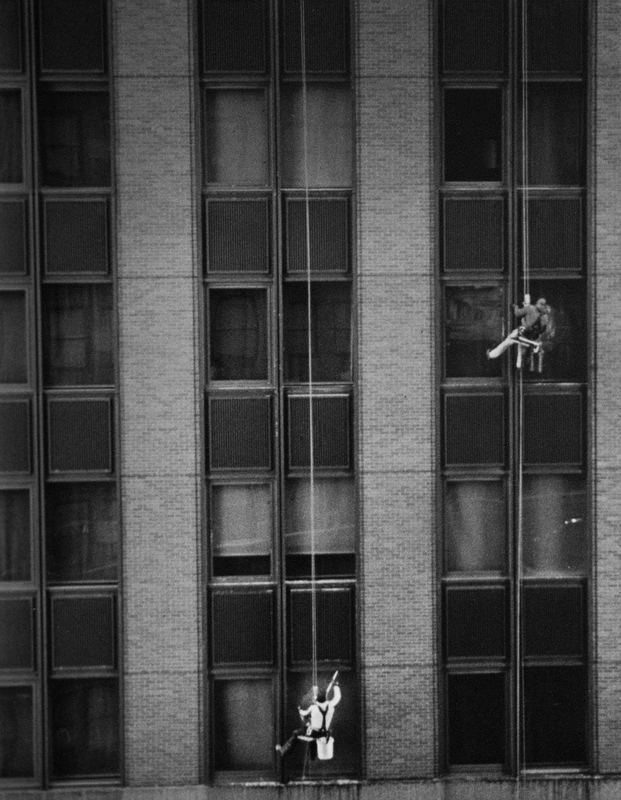 Through music, photography and some amazing people, I came to realize that even though it might take some vulnerability and what feels like randomness, I could find a friend in this mystical giant.Window Washers on Wall is a gelatin silver print from Crowded Isolation that demonstrates caging architecture, while also attempting to show the uniqueness that one stumbles upon in day to day city life. ​Born and raised in Olean NY, Eileen moved to New York City after attending James Madison University in Harrisonburg Virginia. While in NYC she attended classes at the International Center of Photography. There she learned the basics of digital, portrait and film photography. Her website www.protos-photos.com is where she displays a variety of her collections as well as periodic blogs about different experiences. Currently, working primarily in black and white film photography, Eileen recently moved back into the area to pursue an MBA at St. Bonaventure University. Once settled she intends to set up a dark room and continue to work with one of her favorite mediums.